Mr. Maneesh Agnihotri, Regional PF Commissioner – 1, Bangalore has kindly accepted our invitation to be the Chief Guest and deliver the Keynote Address at the above Session.Mr. Maneesh Agnihotri, Regional PF Commissioner – 1, Bangalore has kindly accepted our invitation to be the Chief Guest and deliver the Keynote Address at the above Session. The Supreme Court of India passed a judgment stating that the special allowances paid by an establishment to its employees would fall within the expression "basic wages" under the Employees' Provident Funds and Miscellaneous Provisions Act, 1952 ("Act") under Section 2(b)(ii). Hence any amounts that are payable on account of variable performance or those that are linked to an incentive would not fall within the definition of basic wages and would be excluded for calculation of the contribution towards the provident fund. Only such allowances not payable by all concerned or those which are not earned by all employees would stand excluded from the deduction to the provident fund. Therefore, variable pay or payment linked to performance would not be part of the basic wages. The judgment will have an impact on how much contribution an employer would make towards Provident Fund. It is important that employers need to re-examine what constitutes basic wages is in accordance with the stipulations made in this judgment. This Interaction basically intends to enlighten participants on the recent Apex Court judgment and its implications on the corporates. CEOs, MDs, COOs, CFOs, HR heads, statutory compliance and facility managers, company secretaries, legal heads, Management and labour consultants and Advocates, Construction companies and contractors, B – School and law students. · The detailed analysis of the exact impact of the judgement. · Clarifications of queries by the expert panel. Thanking you and looking forward to your support by way of participation in making this programme an eventful one. 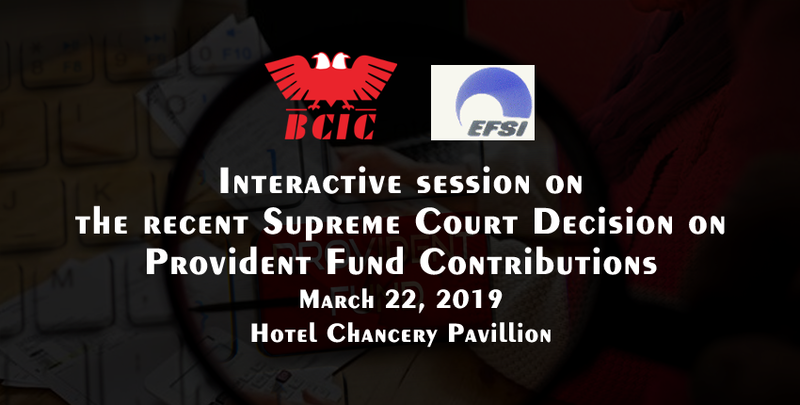 Kindly confirm your participation to bcicevents@bcic.org.in.